Arriving on launch as the world’s smallest interchangeable-lens camera, the Sony A1500 was also one of the first to depart from its manufacturer’s formerly NEX branded series to its more universal ‘Alpha’ branding, a naming convention at one time reserved for its DSLR and SLT cameras. Coming after the A5000 and A6000, the palm-sized A5100 offers a viable alternative or complementary option. It's big on features despite diminutive proportions, including a high-resolution – at least for its class – 24.3 megapixel APS-C CMOS sensor. For those photographers into ‘selfies’ as much as still life, this portable compact system camera also comes sporting a tilting LCD that can be flipped upwards through 180°. Not only that, but, falling into line with its rivals, the monitor here is usefully a touch screen, thereby providing users with a best of both worlds operational approach. Convenience and ease of use is further extended by the fact that the camera naturally features Wi-Fi and NFC connectivity options, whilst accuracy and swiftness of performance is enhanced via a whopping 179 focal plane detection AF points to truly allow the camera to strut its stuff. Feeling solid in the palm, and in spite of its slightly utilitarian appearance and design, this Sony also handily finds room to feature a pop-up flash. Plus, what has remained consistently praise worthy across each iteration of ‘Alpha’ cameras is that results are colour-rich and contrast-y, requiring little if any alteration straight out of the camera. Battery life is also good for 400 shots from a full charge. Given the above, this is a good option for beginners, or those upgrading their image capture device from a smartphone. On the Sony A5100’s launch there were originally both body-only and kit lens bundle options available to purchase. Small cameras like this often look a little top heavy with larger ‘glass’ affixed to their front plate, but a sound companion in this case in terms of both versatility and portability is its maker’s retracting 16-50mm power zoom. A plus for anyone sizing up this option for video use is that the mechanically powered zoom ensures a steady jerk-free motion when filming video, which otherwise requires skill to achieve by hand with a manual lens; again making for a sound starter option. 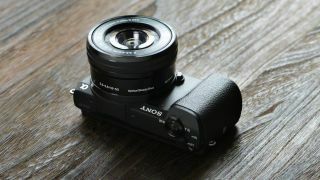 What was, at its conception, the smallest Alpha CSC in Sony’s range, the jacket-pocket-friendly A5100 is more than capable of competing with the big boys.